As head of Michigan Auto Law, Steven M. Gursten focuses his practice on serious motor vehicle accident injury and wrongful death cases. Steven has recovered some of the highest reported settlements and jury verdicts every year, including the top-reported auto accident or truck accident jury verdict and the highest auto accident and truck accident settlement in Michigan over multiple years, according to Michigan Lawyers Weekly. Steve frequently lectures at legal seminars throughout the country on trucking litigation, trial advocacy, and traumatic brain injury cases. He also speaks on maximizing auto negligence and truck cases, including at several advanced trucking legal seminars throughout the nation. 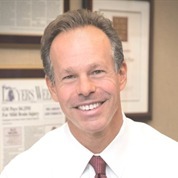 He has been named a “Leader in the Law” and “Lawyer of the Year” by Michigan’s largest legal newspaper for his record-breaking auto accident verdicts and settlements and advocacy work in preventing wrecks.